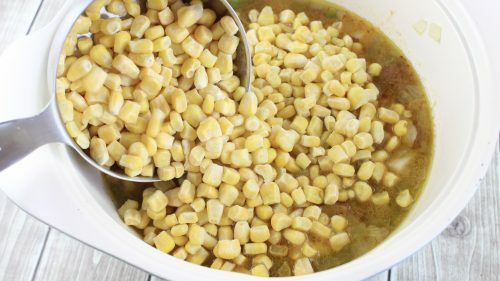 This comforting corn chowder is a long time family favorite and perfect for company and cold days. Before we begin, I’d like to give a special thanks to all of my readers with a sense of humor for bringing your smiles and laughing along with me! This post is for my reader, Joe, who really needs to see a tree today :). I’ve been in such a soup and stew mood lately and its all due to our recent delivery of cold weather. You see, it just now got a little bit cold in the south. Now I say a little bit but anyone else around here would tell you its downright frigid. Normally I would be in agreement with them but after having visited Canada several years back in January, I am now privy to cold on a whole new level, one that is almost unfathomable to a lifelong southerner. If you have time to visit a spell, keep on reading for conversation and step by step photos of making this. If you are in a bit of a rush and need to jump to the recipe, please click here. You see, here in the south, we’re complete pansies when it comes to winter. We wait and hope, keeping our winter clothes on standby, often suffering through short sleeves and perspiration as late as Halloween…and then one day it hits. A frost! GRAB THE TURTLENECK!! IT’S SIXTY DEGREES!!! We get all excited about pulling out that part of our wardrobe which we get to wear maybe two or three months out of the year – four if we’re really lucky. Then by the time January rolls around, the novelty has worn off. The skies are overcast and we’ve got a doozy of a case of cabin fever. We were not engineered to handle this. How do others do it? How on earth do you manage a cold season that lasts more than three months? My birthday is in February and that’s about as much as I can take. I can wait til then and maintain my sanity. Come February (most years), daffodils are in bloom and spring is going for her first spin around the block. Bet you ninety to nothing that we’re complaining about winter not lasting long enough by the time July rolls around though. This is my only chowder recipe. Chowder has never seemed a southern dish to me, but I sure to enjoy this one. It’s the name that makes it seem non-southern I guess. I picture folks coming in from lobster fishing (or catching…or whatever it is you do to get lobsters) wearing thick sweaters and speaking like the Kennedy’s. Other than this one, I’ve only had one other type of chowder – clam. My mother is going to die when she reads that I actually ate an entire bowl clam chowder. She does NOT do seafood in any way, shape, or form. Truth be told, I don’t either. However, I was invited to a friend’s house on Christmas Eve (which is, of course, an honor) and they were all excited about their traditional Christmas Eve meal. Now, if there is one thing a properly raised Southerner understands its pride in the dishes you grew up on! The last thing a polite person would do is anything at all that might seem to insult it. Other than pond raised catfish (which I have now given up as well), I’ve managed to avoid everything that lives in the water since then! 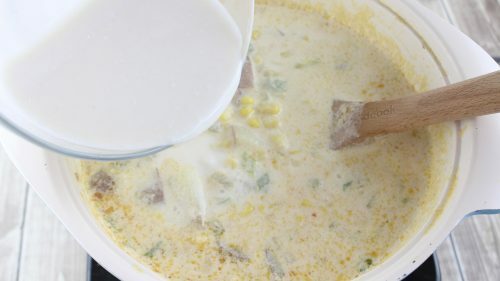 This corn chowder is a great meal for vegetarians. Simply substitute the chicken broth with vegetable broth and you’re off to the races! It is hearty, filling, oh so warm, and has just the right blend of flavors. I adore it. Special thanks to my sister in law, Tina Jordan, for passing this recipe on to me many years back. 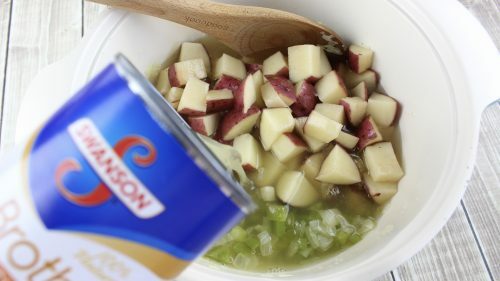 You’ll need: Onion, red potatoes, jalapeno peppers, paprika, frozen corn, milk, green pepper, chicken broth, flour, salt, butter, crushed pepper flakes, and green onions. The original recipe also calls for a bit of Dijon mustard. I do recommend using this but I didn’t have any and y’all know how I hate to go all the way to the store just for one little ingredient when I can very well do without it. 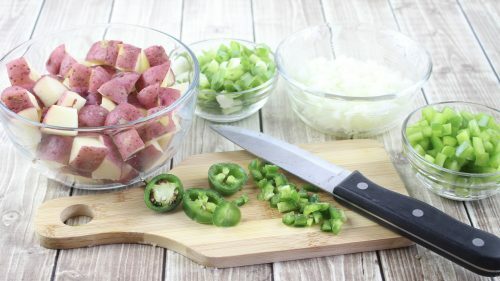 Chop bell pepper, onion, green onion, jalapeno, and potatoes. You can also use a jalapeno from a jar if you like, or leave it out entirely – but the little bit heat it lends adds great body and flavor to this. Melt your margarine in a stock pot over medium heat so you can saute all of this goodness in it. 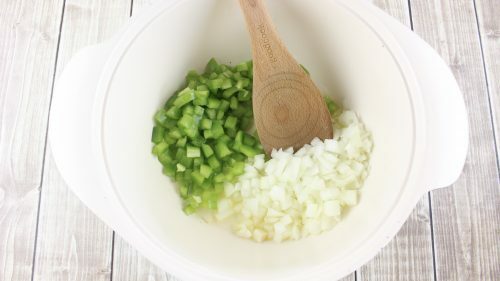 Saute white onion and bell pepper until tender. For those of y’all just now joining the Southern Plate Family, I wanna say two things. First of all, WELCOME! We’re so glad you’re here. Secondly, Yes, you can use wither real butter or margarine if you like. I fully understand that budget is a necessary component in ingredient choice. No judgement here. Saute onions and peppers until they are tender. This will just take a few minutes on medium high heat. 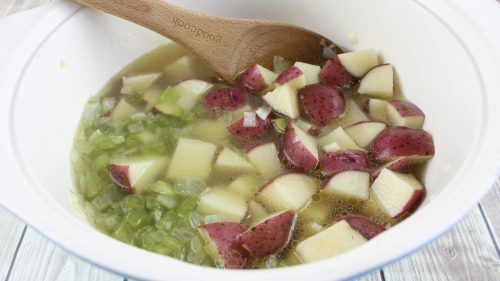 Add potatoes to stock pot. Pour in Chicken Broth. Bring to a boil. Reduce heat and cover, cooking for about fifteen minutes. Add chopped jalapeno, salt, crushed red pepper, and paprika. You can use canned corn if you like, I just prefer frozen. Here is a little grocery tip: If you are ever out and about and need to pick up something cold but don’t have a cold bag with you for your car, just pick up a bag or two of frozen corn. This acts as a wonderful ice pack, usually costs about a dollar per bag, and is always handy to have in your freezer. Add 1.5 cups of milk. Bring this just to a boil and cook for about fifteen minutes, stirring from time to time. Add in the chopped green onions. Add flour and remaining milk together and give this a good stir to blend until it’s smooth. After the fifteen minutes of gently boiling your chowder, pour milk/flour mixture in and stir again. Cook this for about two minutes, or until thick and bubbly. And you’re done! Doesn’t that look YUMMY? My sister in law likes to add bacon and cheese when she makes this. In medium sized stock pot over medium high heat, melt butter and then saute' onion and bell pepper until tender. Add broth and cubed potatoes. Bring to a boil, reduce heat, cover and simmer for fifteen minutes. Stir in jalapeno, salt, paprika, and red pepper flakes. Add corn 1.5 cups milk. Bring just to a boil, stirring from time to time. Add green onions. Combine flour and remaining milk and mix well. Gradually add this to the chowder. Boil while stirring constantly, for two minutes or until thick and bubbly. Serve hot. Top with bacon and cheese, if desired. I originally published this recipe in 2008 and have recently updated it with new photos and better written instructions. I hope you enjoy this long time family favorite! WHEW isn’t that ingredient list long? Y’all know I wouldn’t have a recipe with THAT many ingredients if it wasn’t good!! Still, no weird stuff that you wouldn’t be able to use again in another recipe!! Today is a GREAT day waiting to happen! Get out there and enjoy it!! than to aim for the ditch and hit it. Submitted by Donna. Submit your quote or read more by clicking here. Thanks for the great recipe. I do have to say, though – clams are no stranger than pork brains, which I ate plenty of times growing up in South Carolina! So funny….get outta my brain, Tom! Hey Christy! Thanks for making me famous. No autographs, please. I add about 1 1/2 C extra sharp cheddar cheese at the very end. I sprinkle bacon bits on top. You could fry up some real bacon, but why go to all that trouble? Oscar Meyer has real bacon bits and pieces where you find the salad fixings. My kids really love this and it warms you up when the south gets frigid. (I woke up this morning and it was 52 degrees in my kitchen!) Anyway, I hope y’all enjoy as much as my family does. I’m going to have to make this tonight, it’s such a perfect dish for this weather. Ooh, and I know my husband will be pleased with the addition of cheese and bacon! I’m over in Georgia and we got a few little snowflakes these past couple of mornings, brrr! I’m from California so I’m not used to the weather here. The highs this week are in the upper 70’s/low 80’s where my family back home is. For that matter, I’m not used to it being as muggy in the summer as it is here either! You know it’s bad when you step outside and your glasses fog up, haha! Like you step out of your house and into a sauna! I must say though, thinking about the hot muggy Southern summers did just make me feel a little warmer inside. Oh yes, definitely do bacon and cheese – that’s a must for almost any chowder!! 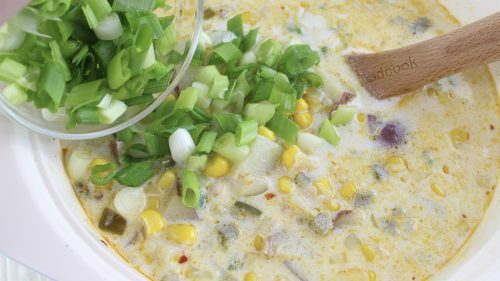 This really looks fantastic, especially with the jalapeno and green onions, I’ve never added that to a corn chowder and it sounds like it would taste delicious. MM I think this sounds yummy too… lady.. all your recipes are family pleasing delicious! Mmmmm….. looks so warm and yummy. Wish I had a bowl right now! This Mississippi gal is COLD! Anything below 60 degrees and that IS frigid to me LOL. Man I forgot about the site changes – I haven’t gotten an update on my blog list for 2 weeks … gotta catch up! 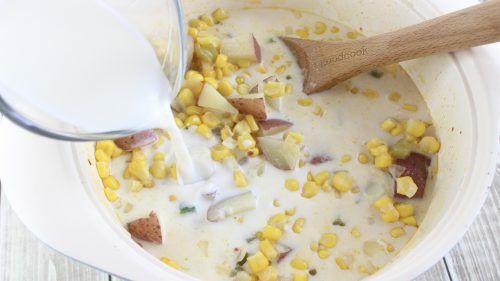 Corn Chowder I can get away with.. Seafood.. no. I love seafood but my dad won’t touch any fish other than catfish. He was in the navy and he said he smelled shrimp cooking 24 hours a day while at sea. The only time they got decent meals was when Eisenhower was on board with them. Christy it is cold here too! (dropped into the 30’s yesterday BUT will be back in the low 70’s today until the rain comes tonite/tomorrow and cools things back down). This sounds so good. I have the cookbook so don’t have to print this one! Will definitely add the cheese and bacon! I made this for dinner tonight and I declare a WINNER! Christy and Tina, Great recipe–had it for lunch yesterday and tonight my son added chicken and a Pillsbury pizza crust(all we had) and made chicken pot pie. It was a winner and gone in minutes! Heather Oh my gosh! How funny! I have the glasses fogging up problem a LOT! That is hilarious, I never really thought about it before!!! Yeah…we do have nice summers – sure would be nice if we’d finally evolve enough to have gills to help us breathe in the humidity though! StephanieOH WOW. 220 inches? ~gulps~ How did the move go, you settled in yet? April Ooh I have a great salad coming up for you too, April!! Seafood but no meat..hmm that’s a new one to me! I hope she likes it!!! Jo ~blushes and guffaws~ Jo, you’re just way too good to me! Mary Well welcome to the new site! I hope you enjoy the changes, lots more to see now! I agree with you, below sixty = electric blanket time! Bill oooh your poor dad! If I had of been one to eat shrimp, I believe Iwould have stopped just on reading about his experience! Connie Now y’all are making me have to make this again, with everyone having it with cheese and bacon you know I can’t be left out!! April OH YAY!!! I love hearing that!!!!! THANK YOU for letting me know!!!!!!! I’m so thrilled!!! Deborah Now if you aren’t the neatest thing! What a cool idea! I gotta try that one too! Michele Hey! Let me know if you get a chance!! Thanks to all of you for reading Southern Plate and for taking the time to comment! I wound up making this last night instead of back on the 2nd. It came out really delicious, and my husband loved it! I wound up taking the idea of bacon and running with it. I cooked about 1/2 a pound of chopped up bacon in a separate pot, and added it to the chowder at the same time as the corn and green onion. I got the kind from Wal-Mart that’s covered in pepper. And of course once that bacon was cooked up I put the grease in a jar I started after moving to GA. I keep mine in the fridge though. My grandma used to keep hers on the top of the stove. Anyway, the chowder was awesome and all that peppered bacon really gave it good flavor and peppery-ness. Thank you for sharing this great recipe, Christy! We loved this…the pot was licked clean. My 17 year old son actually did the cooking, it was a very easy recipe for him to follow. He also added 1/2 a pound of bacon. This recipe got two thumbs up from this northern Illinois family. Hi Christy! Not sure where you were in Canada in January, but I can tell you the part that I live in makes most Canadians start a-shivering in July just imagining it. I know what you mean about Southerners and Winter … I remember being in Arkansas in November in 65 degree weather and people were pretty much in straight “you people are crazy” mode when they heard we were going to sit in the hot tub for a while. Anyway, back to the Chowder. It’s a favorite of mine as a hearty soup, and I often make it over an open fire on the lake in summer … being outdoors all day makes you hungrier, and there’s no good reason to go home at noon when you’re out fishing. It does get as hot in summer here as it gets cold in winter. Okay, maybe not … but 105 F is considered a normal temperature here in July, although 80~95 is more common. Anyway … I’m going to try this a second time. Back to the Chowder. I see a few people talking about adding bacon bits at the end. You’re half way there. What you need to do is cut up some bacon into small pieces and fry that, for about 1 minute or so. 2 slices would be fine. Then you add the butter to your skillet, and your onions, (I add celery), peppers, and saute away. The other thing is you can make a chowder from anything, it doesn’t have to be clams, although people who live near the ocean eat it that way. It’s not really a “red meat” dish, but chicken, turkey, fish, shrimp, probably crayfish … you get the idea. 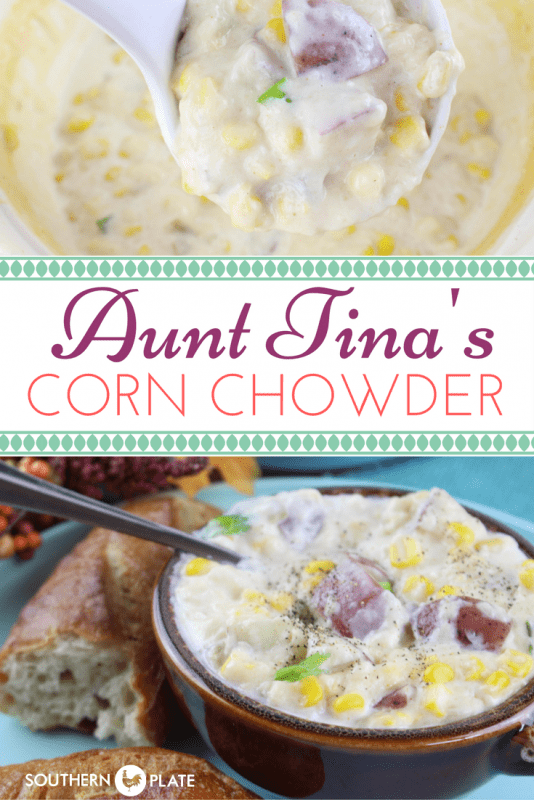 And, aside from potatoes and bacon, in my kitchen chowder always has corn, and a little shredded carrot. The carrot is really there mostly for appearance. Great site … I came her looking for a Southern Gravy recipe. Found one, too. Stay warm down there. Summer’s on it’s way. Yum yum yum! I can’t wait to try this! I don’t know what’s better… the recipe, or the running commentary… you just honestly make me LOL. I BASICALLY MAKE THE SAME RECIPE — BUT I USE CHICKEN , COOKED , PLENTY OF IT &&&&&& IT”S CALLED CHICKEN CORN SOUP .. — A PENNA. AMISH , GERMAN RECIPE – SO GOOD !!!!!! I was just getting ready to add that I would put chicken in that recipe as I live in SE Ohio with aheavy Amish and German influence. 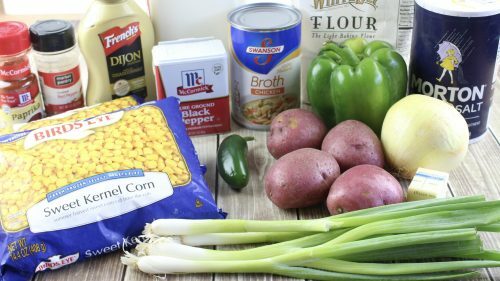 Try adding cooked drained pork sausage to this recipe and omit the green peppers, will be a different variety, Also use cream corn frozen in the roll or fresh instead of whole kernel . Also I have made it with rendered out streak-o -lean instead of bacon or sausage. 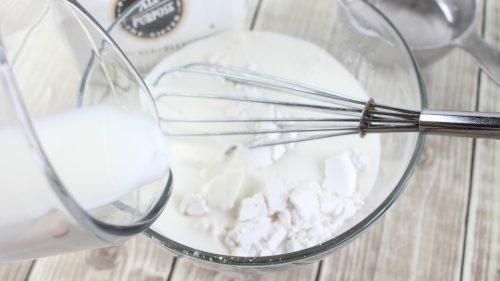 Do this before adding the other ingredients. I enjoy most of your recipes Christy and use lots of them,. I love seafood chowder but I just can’t do it with the bell pepper, but love the hot pepper in it. 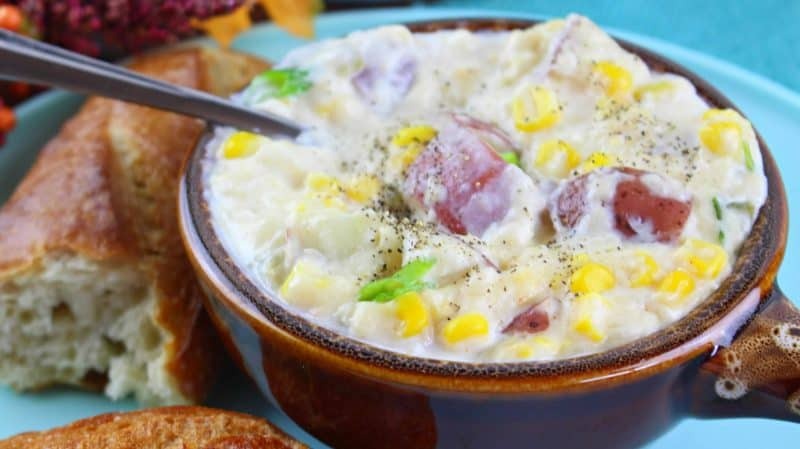 I’ve never wanted to make chowder myself, it just seemed like it would take forever, but this looks sooooooooooooo easy!! Can’t wait to give it a try!! Thanks!! The root end of green onions can be planted, and they will grow into green onions again. No need to keep buying green onions. Try it it works. I’ve done it. Love this chowder too! But correction on one thing…those little peppers in the vinegar bottle (that any good Southern restaurant has sitting on the table) are not jalapenos. They’re just some sort of good! One thing I do sometimes is add a can of white chicken breast meat or if I really have time, boil my own. We had this for Christmas Eve…so good! Love you posts and recipes – you’re a true belle! I do not eat chowder but being from Iowa you might think it odd but I love grits and also collard greens. I understand they are both Southern foods so I do not know where i acquired the liking for them as I have never been to the south. I hope your Christmas was the best ever! 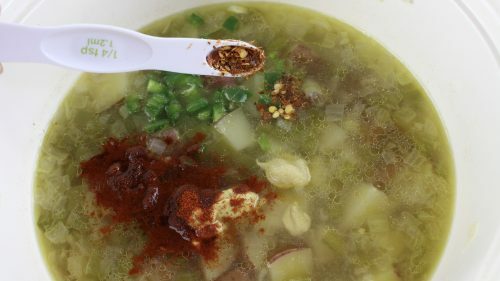 out New Mexico way, we add a heaping cup of roasted, peeled and chopped green chili to this (or you can find a can in the ‘ethnic’ part of most grocery stores) instead of green pepper. Delish and rich enough to feel special..
It’s 18 degrees here in WV. the snow is really coming down hard, this makes the 7th/ snowfall we’ve had since Thanksgiving, I’ve heard there are no two snowflakes alike can you imagine that? I’ve never eaten any type of chowder and at my age I don’t think I want to try any this late in the game. I do have both your cookbooks and dearly love your newsletters. Let’s keep Christ in Christ—mas. Soup looks great, may have to try it.